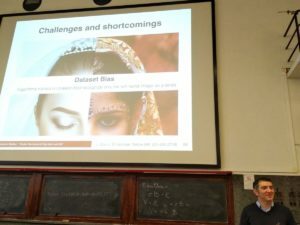 I recently gave a talk at “The Law of Big Data” seminar series @UniPD (you can watch the video on YouTube). How AI and big data are affecting our society, culture and laws? Many are claiming that data is the “new oil”, and the data-driven / machine-learning paradigm is changing how we address many different problems. Self-driving cars, robot caregivers and chatbot platforms are really happening, while they were only popular sci-fi topics until a few years ago. The aim of this lecture is to introduce the key concepts that have led to these results, to highlight what are the main challenges and open problems, thus trying to unveil what’s in the box.